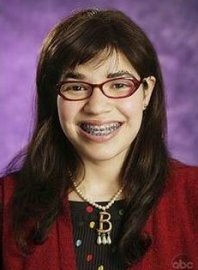 Ugly Betty and her braces. Ugly? I think not! Braces are the latest in fashion statements. I keep meaning to write a long article for skepchick, but I can’t. I really need to study for my geology midterm tomorrow, but I can’t focus very well. I’m hungry, but I can’t eat anything that’s not mushy. Why not? I was recently tortured at the dentist for three hours, and I now have braces. A couple of years ago, my dentist suggested I get braces. Basically, when I was eighteen I had four badly-impacted wisdom teeth. They pushed my teeth around so that my jaw only closes properly on one side– on the other side, my teeth grind into each other. I put off braces for a few years, but I finally went ahead and got them. Why? This is the last year I’m on daddy’s dental insurance, and I’m sure not paying for orthodonic treatment on my graduate student salary. The drawbacks of my braces? 1. I look several years younger and am carded more frequently at bars. 2. My teeth hurt like hell. 3. I can’t eat properly. I’m hungry, and I’m almost out of soup. 4. I can’t talk properly. I have a weird lisp. 5. There are sores developing on my inner lip, despite large quantities of wax and cold sore treatment. 6. I can’t concentrate on my work and am procrastinating greatly. 7. Kissing/making out is more difficult. The benefits of my braces? 1. I am carded more frequently at bars. The other night, the bartender felt guilty for carding me because I had braces and gave me a free drink. 2. My fellow MIT students sympathize with me. Many of them went though terrible braces experiences as kids or teenagers. Many of them still have braces (err… excuse me, “grills” according to Weird Al). 3. My teeth hurt like hell. This means I’m allowed to whine / be grumpy / demand ice cream. 4. Braces are actually a new kind of fashion statement, such as in Singapore. 5. I can’t talk properly. No presentations for me this week! 6. I can’t eat properly. I’m forced to eat eggs and soup, primarily. I think I’ve already lost a pound! 7. In a year to two years, my mouth will close properly, and my beautiful smile will return. 8. I can’t think of a positive spin for the mouth sores. They’re awful, all around. 9. I can’t concentrate on work. Really. I don’t think I’ll be able to work much this weekend, either. Especially if there are any good concerts in town. 11. Kissing/making out is more difficult. Braces force some creativity that otherwise wouldn’t be necessary. To return to the concept of braces being a fashion statement, I think that’s true to a certain extent. More and more kids (and adults) have braces these days, so I think that society is starting to accept them more. Kids may not enjoy their braces these days, but at least they can have fun picking bold colors for their braces and not be teased as much as kids used to be before everyone started getting braces. Also, in a way braces are a sign of wealth. In some poor countries, they’re becoming status symbols. Rightfully so. Even though I’m having my treatment done at a discount by a student at Harvard Dental School, my braces are still costing close to three thousand dollars. And as one teenager said in the Singapore article, “some of my friends even like girls with braces.” That’s right. Some guys are still desperate enough to date me, even with my braces. I’m still hot… by MIT standards at least. Another plus is that you have 2007 braces. I had them back when they were bands that went entirely around your teeth. (Yeah, yeah, I'm a geezer saying "In my day…") The modern ones that cement in the front are so much more light and roomy in your mouth…and I know this because I eventually had both types so I can compare. I was threatened with braces as a kid, but never had them. As a consequence, I now have fangs (aka my canine teeth) that do sit forward of my other teeth. I can feel for you too, having had my own terrible experience with braces (as in, more terrible than the typical braces experience). The day I first got them put on, every single one fell off. After switching to a different glue, the rate slowed to around one every couple of weeks falling off – generally due to the fact that the ones on my front bottom teeth prevented me from actually clenching my teeth at all. In the end, it took me around four years to get done with them, when they'd only predicted one and a half. And then after that, I soon realized that the retainer they had me wear was making things worse, rather than better. But we can save the retainer stories for when you get yours. I had braces on my upper teeth for a while as a youth…they were never terribly pleasant. And since my dad, being a dentist, was quite chummy with the orthodontist, they didn't cost much (or possibly anything? It's not clear). Now I PROBABLY need braces again as my lower two wisdom teeth wrecked my formerly perfect lower arch. I just don't have the insurance or the benefit of an orthodontist friend to help me at this point. And maybe, just maybe, it's OK to leave 'em crooked? It worked for Jewel after all. Perfect teeth are over-emphasized in today's culture, I think. A mouth closing properly is important, though. So, while I'm working on that I may as well straighten my teeth out, too. I was thinking about getting braces because my bottom front teeth are a little crooked. But my mouth closes OK and those teeth don't really show when I smile, so I think you've talked me out of it. I don't think there'd be any chance that I'd be carded, even with braces, though. It might be fun to find out. Nah. Good luck with those. 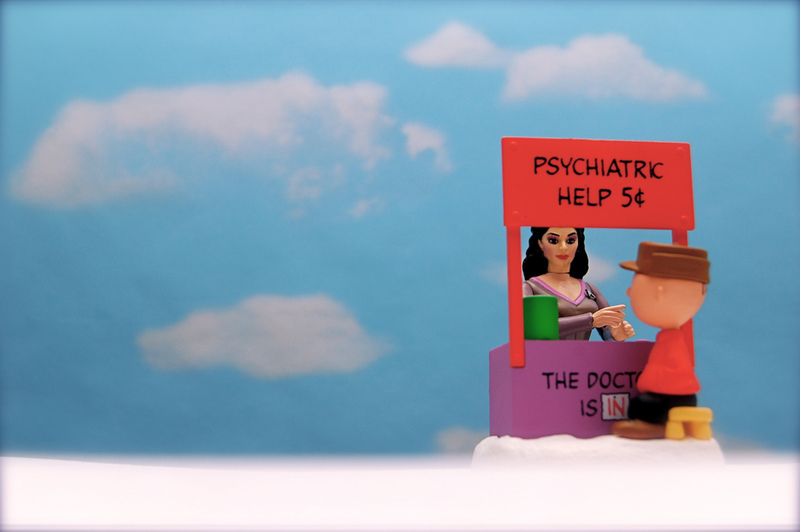 It sounds like you needed them. I mean, if your teeth don't mesh properly in your mouth that can cause all kinds of other problems that are worse than beauty problems. The only good thing about braces is the post braces part – where you have a mouth that closes properly and nice straight teeth! I am pleased with the results I got when I had braces back in my teens but the process is certainly awful. I warn you not to have anything important on the first day you go to have them tightened. It is not as bad as getting them put on but still hurts. And don't you still have to have bands that go all the way around your teeth at the back? I had the cemented to my teeth kind but they still needed to be anchored to my wisdom teeth. Hopefully the sores should clear up as you develop calluses – or at least that is what happened to me. I've never needed braces so I don't have any experience here, but at least you'll have perfect chompers in.. an eternity. My condolences as well. It all sounds so dreadful! But someday you'll have your Evil Lyn grin back! Of course not, perish the thought. You didn't even mention all the annoying tastes you get to experience, from the truly horrible cement while they are putting them in to the milder metallic flavor that makes your food never quite taste right. Anyone get the historic/art link to Bettys necklace? I got braces when I was 31. I should have gotten them at 12, but I was vain. It's not that I was a particularly beautiful 12 year old, but I was vain anyway, and the braces then were still ugly metal bands and they'd make me wear them for four years. It was (and my peridontist, dentists, and orthodontist agree) the stupidest thing I ever did in my life. In fact, when my little sister needed them because of her overbite I said I'd knock her out and drag her to the orthodontist if she put up a fuss. She didn't. Then because of periodontal problems and THE WORST wisdom tooth extraction at 17 (I was in the hospital and couldn't open my mouth all the way for months), I was told I would never be able to get braces. Then in Houston I got two bad absesses (the most excrutiating pain I've ever experienced) and my periodontist believed it could be done. My teeth aren't perfect, because of the gum issues, but they haven't fallen out. Floss, people! 3. I canâ€™t eat properly. Iâ€™m hungry, and Iâ€™m almost out of soup. 4. I canâ€™t talk properly. I have a weird lisp. 6. I canâ€™t concentrate on my work and am procrastinating greatly. I was in really good shape when I got braces; I worked in downtown Houston in one of the skyscrapers full of law firms, and the braces didn't seem to make a difference looks-wise. They pulled four teeth out of me, so I even had holes for a while and had to wear the upper to lower bands. Kissing was not a problem, but I did take those bands out for that. But it took about 3 months or so for my mouth to adjust to the chafing – I lived on WAX! I'd gob it up at night along the brackets just to give my inner cheeks a rest. I went through tons of wax. And if a wire wasn't cut or bent right, it would be most painful, and it would have to be adjusted or cut. The talking got better, but everybody was wrong – I gained weight. I started off as a size 8 and 2 1/2 years later I was somewhere around a 10 & 12. (I'm 5'8" and should be a 10 or else my face looks hallowed). It was because I ate all soft foods, such as pasta, ice cream, cream soups, etc. Most soft foods are fattening. Biting into fruit, eating corn on the cob were impossible. My brother-in-law had to scrape off the corn for me like I was a little kid. I love fresh corn on the cob dripping with butter and salt, so I missed that for a few years. I did look younger than usual, but I was told the braces made me more "approachable." Whatever that meant. I could not eat a hamburger with everything on it in front of people. If it wasn't on a fork it would get embarrassingly messy (I carried a toothbrush, and still do, in my pocketbook). The bands and rubber chains that go around the brackets were easily stained. The girls in the office would sneak me extra chains and I learned to change them myself. Yellow mustard, coffee, cigarettes, red wine and such, stain the chains. I realize there are red, blue, neon, etc., chains and bands, but that wasn't me. So, I always had tight chains, which actually sped up the process. 16. I canâ€™t eat properly. Iâ€™m forced to eat eggs and soup, primarily. I think Iâ€™ve already lost a pound! 8. I canâ€™t think of a positive spin for the mouth sores. Theyâ€™re awful, all around. 11. Kissing/making out is more difficult. Braces force some creativity that otherwise wouldnâ€™t be necessary. Lucky you if you lose weight! The pain goes away after 3 months, as I said, as your mouth adjusts to the roughness. I didn't experience much pain every time they were tightened – maybe a day. The sores will go away, but until then wax will seem like the greatest invention. Being able to comfortably close one's mouth is a big thing. I had a raised tooth like you (or Jewel) along with a serious overbite, and that raised tooth came down fast! Remarkable thing, orthodontics. Some people miss their braces when they come off – I miss my four teeth. It changed my smile by making it even narrower, but widening my palate at 31 was not something I was willing to endure. My teeth felt slimy at first when they came off. Again, kissing was not a problem! Why do people think that's a problem? If you have rubber bands from top to bottom you can take them out for a while – it won't hurt (unless you're going to make out for hours in one sitting…). And as one teenager said in the Singapore article, â€œsome of my friends even like girls with braces.â€ Thatâ€™s right. Some guys are still desperate enough to date me, even with my braces. Iâ€™m still hotâ€¦ by MIT standards at least. I had braces in high school… but still have yet to have my (five!) wisdom teeth removed. How very sad. I should get on that, as soon as I'm a State Employee and get teh aw3s0m3 b3n3f1tz. I can say, though, that while I thought the pain and soreness would never end, there does come a time when you can remove the wax and eat solid foods (even the ones they tell you not to eat, you just have to be careful).